If you want to set prices for your products in bulk, you can use the "Global Pricing Rules" feature. You will find it by going to Settings > Global Pricing Rules page. You can set the new price for your products in the "Your product price" setting. You can use the "Multiplier" or "Fixed Markup" techniques, that are explained below in more details. Multiplier multiplies the original product price as many times as you choose. For example, a product which costs $2.00 in the supplier's store with a multiplier of 3 would have the price of $6.00 in your Shopify store. Fixed Markup allows you to set a fixed amount that is added on top of the original product price. For example, a product which costs $2.00 with a fixed markup of 3 would result in a price of $5.00 in your Shopify store. The "Your product compared at price" technique allows you to create artificial product sales in your Shopify store. To enable them, toggle the setting and add your desired multiplier or fixed markup. Take note, that the set "Your product compared at price" value have to be bigger than the "Your product price" setting value. For example, if the product costs $10.00 at the supplier's store, and you set the "Your product price" multiplier to 3 and the "Your product compared at price" multiplier to 6, then this product will cost $30.00 in your Shopify store. 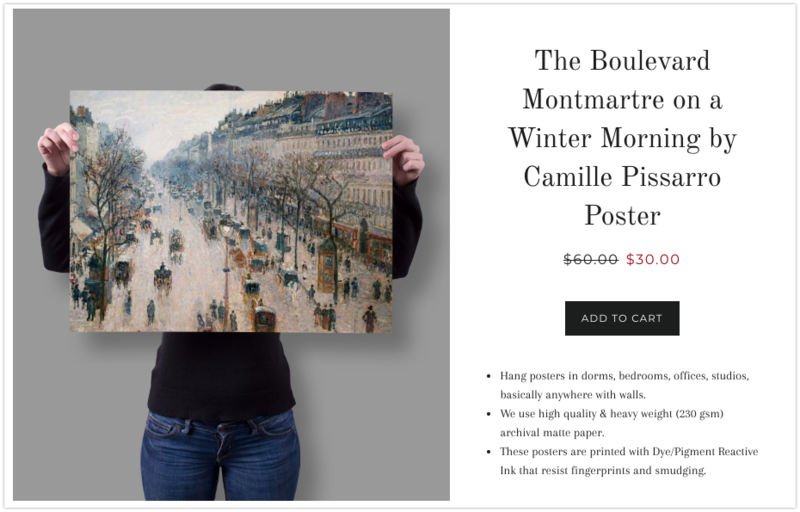 The old product price will be shown at $60.00. The Advanced pricing rules feature is used to set the product prices depending on different suppliers' product price ranges. This is especially effective when you are selling different types of products and their cost range is really wide. To enable them, toggle the setting, add your desired cost ranges and then multipliers or fixed markups. You can enable the "Compared at price" option too. The supplier's price is $5.00 --> the product will cost $25.00 in your store. The supplier's price is $15.00 --> the product will cost $60.00 in your store. The supplier's price is $25.00 --> the product will cost $75.00 in your store. The supplier's price is $35.00 --> the product will cost $70.00 in your store. The "Assign cents" feature allows you to have rounded product prices in the Shopify store. For example, if the product costs $2.90 at the supplier's store, and you have the global pricing rules multiplier set to 3, and assign cents set to 90, the product price will be set at $8.90 in your Shopify store. 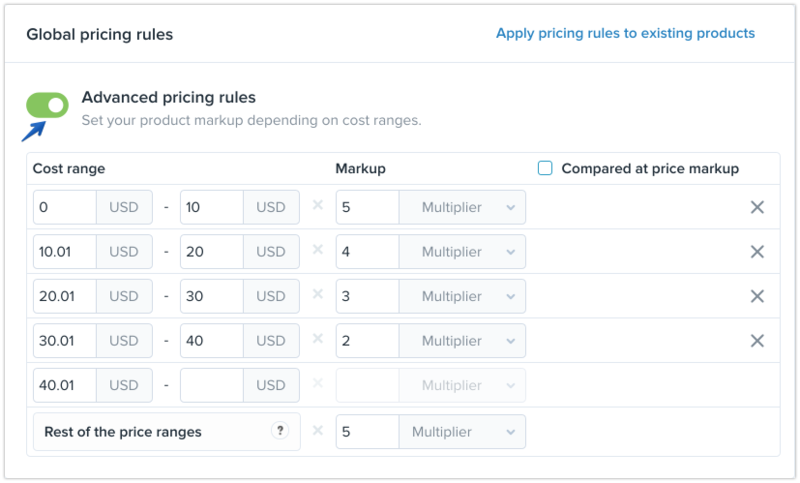 Once you make any changed on the "Global Pricing Rules" page, you need to save them and apply to all existing products. 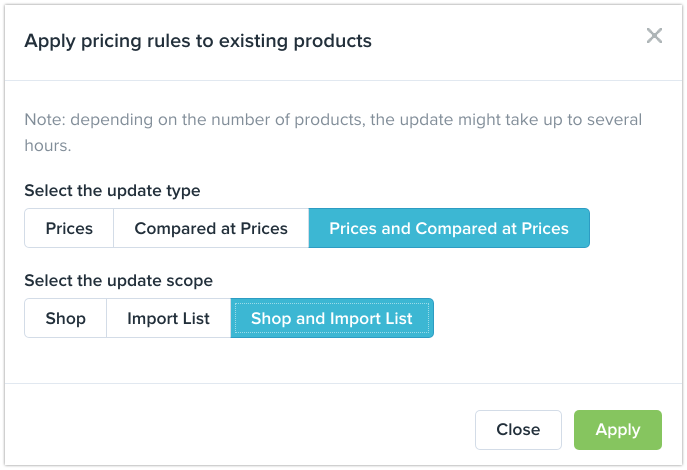 Note: If you do not click on the "Apply pricing rules to existing products", the changes will be visible only for the future products that you will add to the Import list. From the pop-up, choose in which places you want to apply the newly saved pricing rules. Price updates may take from several minutes to hours depending on the number of products Oberlo needs to update.